How Would You Like to Be a Shepherd? Are Sheep Really Afraid of Water? How Do Sheep Protect Themselves? What sports team is named the Lambs? We have Lions, Tigers, Bears, Eagles, even the Rams, but not the Lambs. We like to be identified with the aggressive, invulnerable, macho types of animals. Several years ago Candid Camera hid their camera in a high school counselor’s office. Students had taken an aptitude test and were brought in one at a time to learn what the test revealed. Each one was told, “The test shows you would excel as a shepherd.” The camera focused on their shocked looks! Who would want to spend their life taking care of these homely things! Yet God says we are like sheep and He likens Himself to a loving Shepherd (Psalm 23). 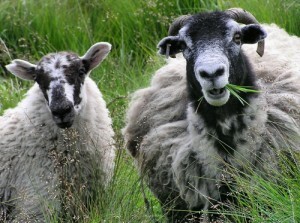 In Sheep (1) we saw that sheep are and always have been dependent creatures. Abel, the second generation, was a keeper of the sheep. “He maketh me to lie down in green pastures.” (Psalm 23:2) Sheep will not lie down in green pastures until dangers and annoyances are past and until their stomachs are full. They take in large quantities of grass, then lie down in the pasture to ruminate. This is the process of bringing up from the rumen (first part of the stomach) that which was swallowed and chewing it more thoroughly. Once it is chewed, the food passes through the other parts of the stomach to be digested. It is humbling to be likened to sheep by our Creator. But it is comforting to know we have a strong and loving Shepherd. (John 10:11, 14).